This common foot pain is often seen in athletes, especially runners. Often times, the condition is thought to be Achilles tendonitis, but it can also occur at the same time as Achilles tendonitis. Common symptoms include a pain in the back part of the heel, especially when trying to run uphill or on a soft surface. Swelling and tenderness in the back part of the heel can make it difficult to wear certain types of shoes. When you press in with your fingers on both sides of your heel, you can feel a spongy resistance. The bursa is a small fluid sac that lies between the bone and the tendon to help the tendon glide smoothly over the bone. 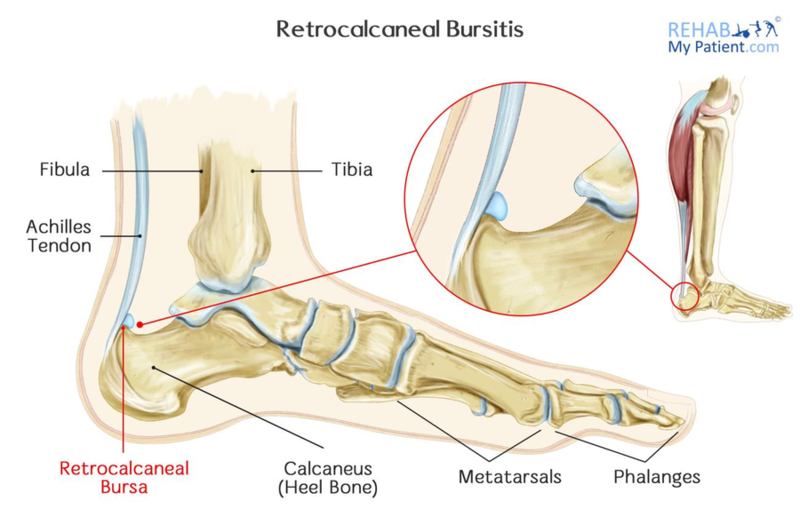 The retrocalcaneal bursa are located between the heel bone and the Achilles tendon. Repeated trauma will cause the bursa to become inflamed. The forefoot contains five longer bones and five toes. The midfoot is a collection of bones forming arches in the feet. These include three cuneiform bones, the navicular bone and the cuboid bone. The hindfoot is composed of the ankle and the heel. The talus bone supporting the leg bones form the ankle. The heel bone is the largest out of all the bones in the foot. Tendons, muscles and ligaments run along the surface of the feet, which allows all of the complex movements that are needed to maintain balance and motion. The Achilles tendon connect the calf muscle to the heel, which is essential for jumping, running and being able to stand on your toes. Apply ice to the affected area for 5-10 minutes at a time three to five times per day. Avoid applying the ice directly to the skin. Use a thin towel to prevent any ice burns from occurring. You can also wrap the ice in a wet tea towel to help protect your skin and provide you with relief. If you find that the heel is bothering you, try to stay off it as much as you can to give it time to heal. The more pressure you put on the foot, the worse it is going to become. Tape the bursa using a donut shaped pad to help alleviate some of the pressure caused by wearing your shoes. An anti-inflammatory medication can provide you with relief from the pain and inflammation in the affected heel. Use for short term, and replace with ice after a couple of weeks. Using electrotherapy can help to reduce swelling and inflammation. Steroid injections followed up with rest for 48 hours can help those suffering from persistent cases. If the condition doesn’t respond to traditional treatment methods, surgery might be required. When running, make sure to wear the proper footwear to keep your feet protected at all times.